Recruitment Advertisements: Assuming that you have already defined the Key Performance Indicators (KPIs) for each job position, your first step should be to write the recruitment advertisement in a way that attracts top performers. Make it clear that you are seeking to interview top performers with a track record of delivering effective results. Structured Interviews: The purpose of a structured interview is to determine if the skills, temperament, and performance record that the candidate brings, match what the position requires. The interviewer has a standard set of questions with additional ones designed to probe further as the need arises. This makes it easier for the interviewer to evaluate and compare candidates. Developing a good structured interview is challenging, because it is competency based. This means that each question is aimed at identifying whether the candidate has the skills and knowledge required to perform well in the job or the underlying ability that makes it possible for the candidate to easily acquire the needed skills. To develop a good structured interview, the interviewer must be able to rely on a detailed job description with the Key Performance Indicators clearly defined. The key job responsibilities must be grouped around the core competencies required, and each competency identified and quantified. You have defined that among the many responsibilities of your company’s receptionist, she has to answer incoming calls, provide basic information to callers, forward calls to appropriate employees in the business, and take messages as appropriate. What are the competencies required to perform this function? Because of the nature of your business and client base, the receptionist needs to speak fluently in both English and Spanish. Because everyone in the business is fluent in English, she only needs to be able to write in English for the purposes of messages, email, etc. She needs to know how to manage a 12-line switchboard-style phone, or have the underlying ability to learn this skill. She needs to speak clearly. She needs to have the ability to multi-task and remain calm under pressure. She needs to have a pleasant and polite manner. And above all, be able to deliver a good first impression of your business to callers and visitors. Do you have experience using a multi-line phone system? Tell me about the most stressful work experience you can recall from the past year. How did you handle it? Can you give me an example of an achievement you are particularly proud of? 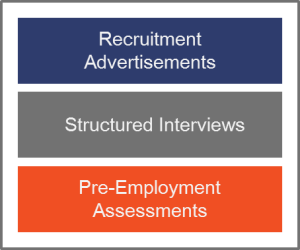 The ‘structure’ in Structured Interviews – In a structured interview, the interviewer has all of the questions he will ask identified in advance, and they are written down in the order they will be asked. Each candidate is asked the same basic questions in the same order followed by others as the situation requires. Variances between interviewers are minimized. It is easier to directly compare different candidates. It minimizes personal bias of the interviewer as a hiring consideration. It focuses the decision making process on the competencies required to perform the job function. If a structure is not followed, a poorly constructed set of questions may miss key areas, or may cover areas that are not relevant. Unclear or ambiguous questions may confuse the candidate. While there may be some limitations with a structured interview process, most of these limitations can be overcome by developing a well-structured interview format over a period of time. In situations where managers regularly interview and hire for the same position, this is especially achievable. Each time the interviewer performs a set of interviews, he or she has the opportunity to refine the structured interview questions on the basis of past experience. The focus on competency-based selection, the reduction in personal bias, and the consistency of selection results, all make structured interviews a very attractive proposition for managers and executives who want to hire the right talent. Pre-Employment Assessments: Pre-employment assessments are a critical part of selecting the best available candidate for the position. Studies have shown that the use of pre-employment assessments dramatically improve organizational fit, reduce turnover, and consistently result in more qualified employees being selected. Pre-employment assessments focus on the competencies required for the job, the potential of the candidate to deliver the desired results, and in some cases, exposing undesirable traits. Knowledge or proficiency assessments (such as a typing test). Literacy assessments (to measure reading or numeric literacy). Honesty and integrity assessments (designed by psychologists to predict trustworthiness and honesty). Physical ability assessments (if the job demands it). Background check (may include criminal record, driving record and credit history).